After a very long time trading below the powerful 20 MA and 50 MA, the Dow Jones is now back in bull mode trading above the 20 MA and 50 MA. What's more is it is experiencing a bullish cross. It has been quite a long time since I wrote something here. With the Malaysian Election GE 14 in play and managing my own finances, I have taken a back seat in the US market for awhile. Now that we have a change of government in Malaysia, I will also be a bit busy catching up on local things. 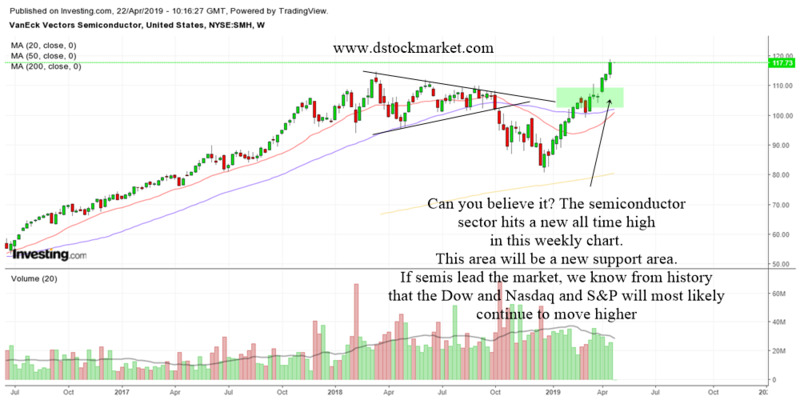 Therefore, I will not write as frequent as I used to but only try and highlight some of the important things happening in the US stock market and also local markets and regional markets. I believe writing only on important points or observations will serve you better as well as helping me to conserve time for more important things. Many of you are readers from all over the world and a good lot are also from Malaysia where I come from. Guess you might have missed my observations while the Malaysian GE 14 was happening. 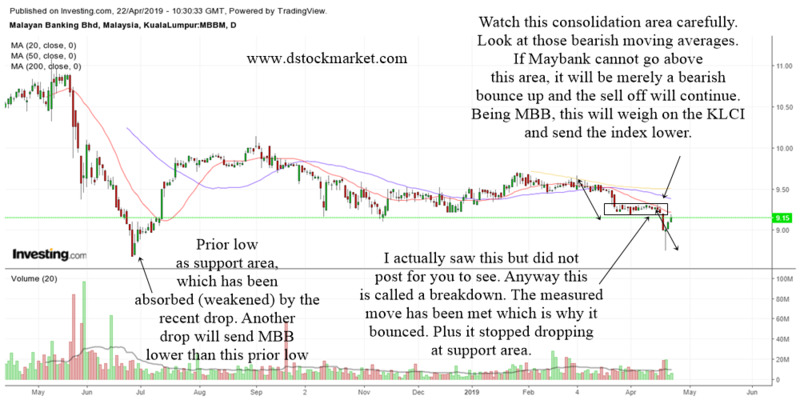 For your information, a week before the GE 14 was to take place, I notice heavy selling in the Malaysian market and thought came to my mind that the ruling government are about to lose the election. True to its value as a predictor of elections, the Malaysian market indeed hinted of a victory by the then opposition. Investors who are aware of local sentiment and political winds as campaigning begin caught the smell early and started to sell to protect their positions. I think news have spread around the world that my country now has a 92 year Prime Minister, the oldest Prime Minister in the world who hopefully can steer the country to greater heights. I believe that he can. Quite a talented and good politician whom my father served under last time. Anyway I digress and now let's move back into the realm of the US stock market. One of the bullish phenomenons that investors can experience is when a major index have a bullish cross. Bullish crosses give us hints that the stock market may be on the verge of experiencing another bull run up. As you can see from the chart above, the Dow stayed above the 20 MA and 50 MA for the entire part of late 2017. This was a picture of bullishness and when it crossed below these 2 moving averages, we started to experience a volatile trading environment. The Dow Jones has been trading below the 20 MA and 50 MA most of the time in the first part of 2018 but recently it traded back above these 2 moving averages. What is great is that the Dow has also made a bullish cross. The last time it made a bullish cross was May 2017 which was about a year ago when it was trading around 21000. Since that bullish cross, it ran up to north of 26000. If history repeats itself we may see significant stock market gains. Notice also how the 200 day moving average is sloping upwards and the Dow Jones is still trading above this significant and powerful moving average. This tells us that the bull market is still alive and more bullishness can be expected. 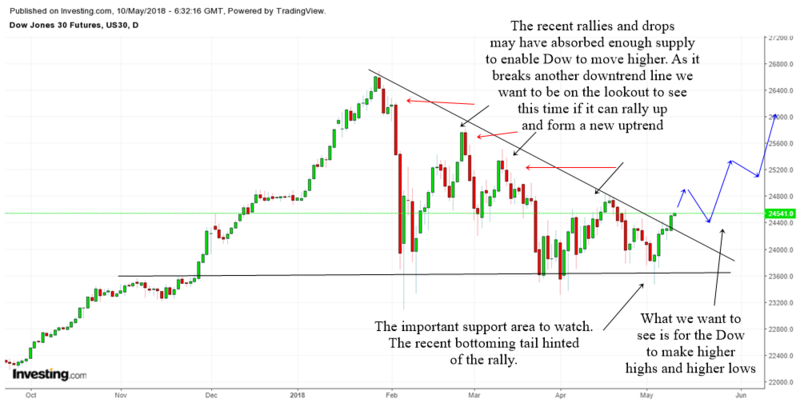 What I want to bring to your attention is that the Dow may be forming a consolidation at support pattern. 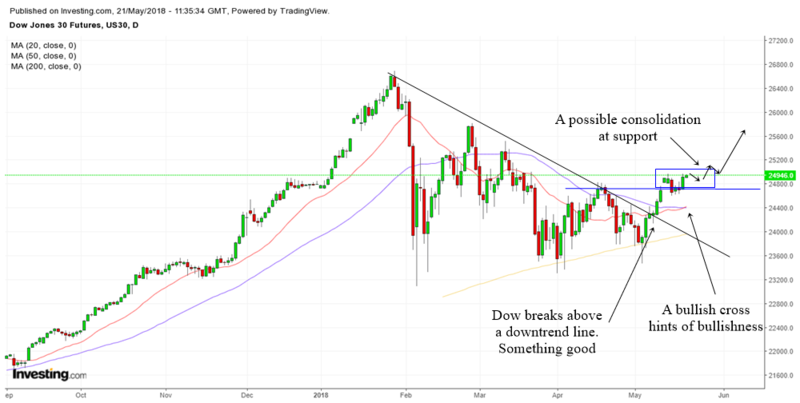 The Dow is consolidating now at the highs made in April 2018 which acts as a support. If it can break higher then this pattern will help to send the Dow higher. The Dow has also broken above a downtrend line and this is a significant development. Most major bull runs happen when the market breaks a downtrend line and also experiences a bullish cross. So, I am starting to be more bullish on the markets. I have attached an annotation which I put into my Telegram Group in May 10 on the principle of absorption of supply. 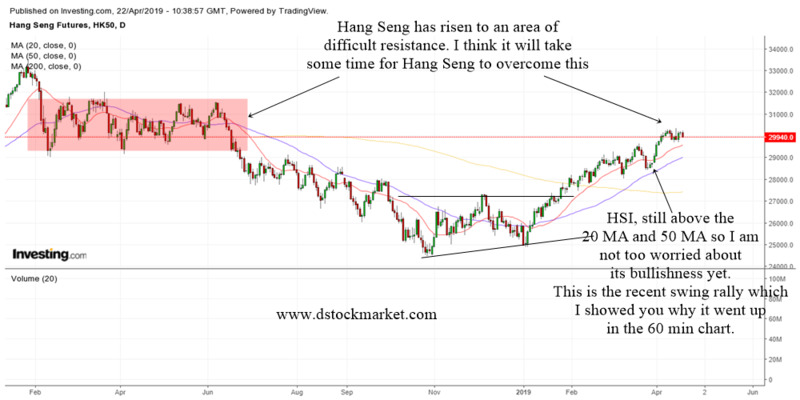 This chart tells us that the many rallies and drops may have done its job to absorb the sellers who want to sell and therefore a bullish case might happen because those who want to sell may have already sold. The important area is still the 23600 area and as long as Dow Jones stays above this crucial area, my bias for the stock market is still up. I do believe that the movement of the Dow might still be in the pattern of... rise a bit and then drop and then rise again. 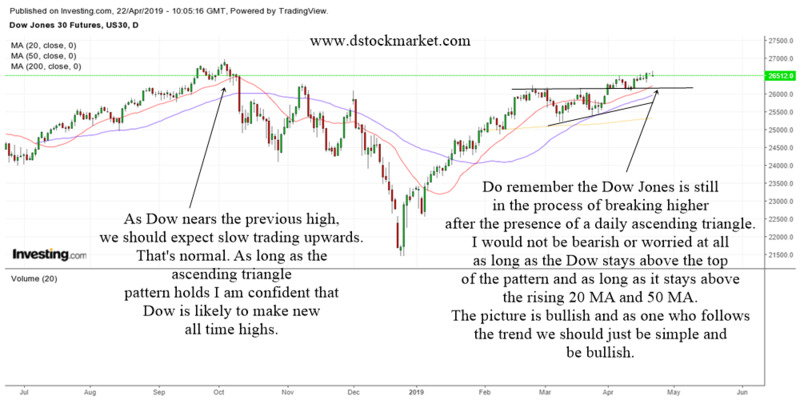 Typically this is the pattern of a stock making an uptrend, making higher highs and higher lows. I do not expect a smooth run up as there may still be remnants of sellers who have lost money in the January, February fall who has yet to regain back what they lost. But overall I believe the majority of sellers would have been absorbed. 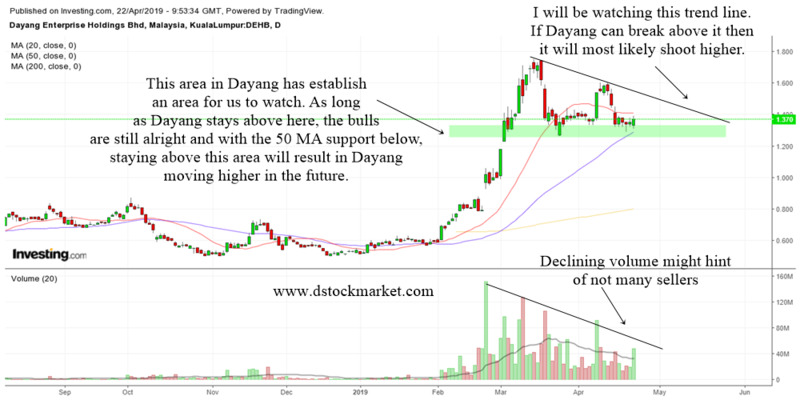 For those who like to do swing trading and short term trend trading, do remember to always follow the 60 min trend. Buy or long when the 60 min chart of SPY, DIA is above its 60 min 20 MA and avoid buying if it is below this MA. Odds are you will be more successful in short term timing if you follow this rule.